These his and her homemade scarecrow costumes were created for my daughter and son. I wanted unique costumes that were original and I came up with scarecrows. My children agreed with the idea and I explained it to their sitter. Their sitter then made the idea come to life with all sorts of hidden features. The girl scarecrow was made by cutting lots of different strips of tulling which were then sewn on a piece of ribbon. Then another piece of ribbon was attached to the front where we placed the big sunflower. After that we attached the leaves to it. The hat was sewn together with pieces of cloth. The boy scarecrow was a bit easier. We found an old pair of bibs and attached different patches and raffia to it to get the feel of a scarecrow. We made raffia bracelets that were sewn to slide on and off for the arms and legs. The hat was made the same as the girl one, but we added raffia in it too. It took about a week all together to make the costumes and the cost of each was about $30. 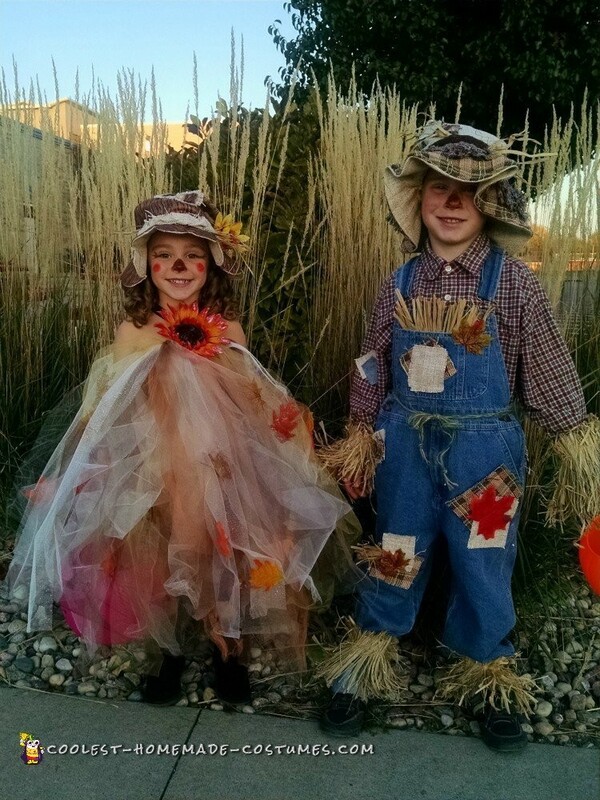 The hats were the most difficult with the sewing required and the challenge of getting them to look cute, but also rustic so they had the feel of a scarecrow. Everywhere we went, my children were getting compliments and I was being asked where I got the costumes. I had to tell them that you can’t buy them since they were made from the love that our sitter has for my children. She deserves all of the credit since my children were thrilled to wear their costumes. Homemade costume idea posted by Heidi W.